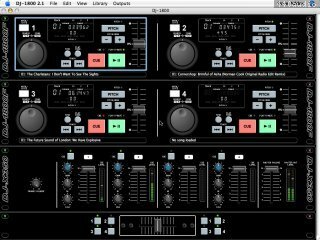 DJ-1800 is an Apple Mac application that emulates the Denon DN-1800F professional CD Player system used by many DJs and radio stations. It allows you to play any MP3 files via a professional DJ-standard CD player interface, with cue, positional searching, and pitch shift and bend. It includes a fully featured software mixer with Master and Cue out, and allows you to manage your MP3 collection and Playlists using either the internal Song Library or iTunes. Added a workaround for a QuickTime audio issue on Leopard with certain audio configurations. 3.1b7 adds support for music stored on an iPhone or iPod Touch, improves MP3 sync, and fixes an incompatibility with iTunes 7.7. [fix] The current track name display on each of the four CD Players now uses Lucida Grande as its font by default, rather than the system font. This improves the text positioning for Japanese language users. [chg] The "Switch to Tracks List" menu shortcut is now cmd-L rather than cmd-T, based on user feedback. The menu shortcuts for updating from iTunes / iPods now have additional modifiers as a result. 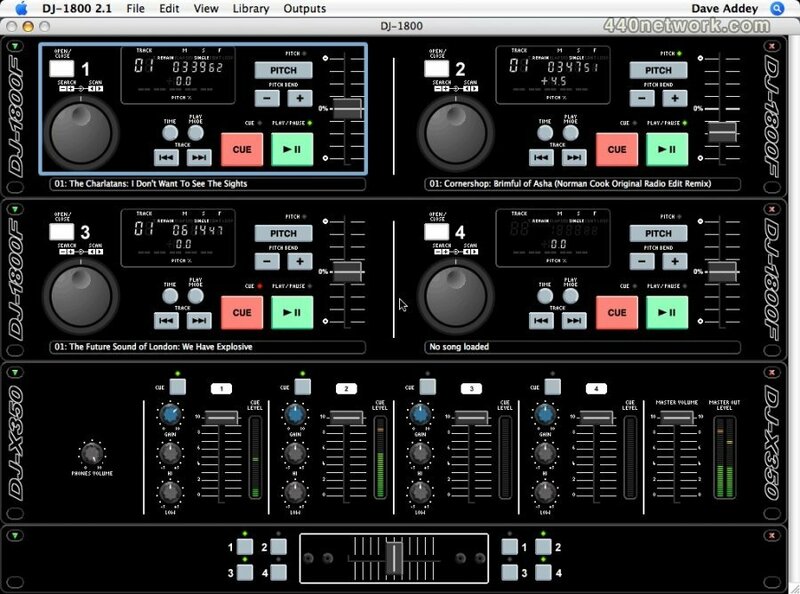 [kis] There is a known issue when using DJ-1800 in "Dual + Mixer" or "Mono + Mixer" mode, on Mac OS 10.5.x, with Pitch Lock turned on. The problem occurs when loading a new track, or when starting playback of a track. Either of these actions may result in a short audio dropout on other already-playing tracks. This problem is caused by a bug in Mac OS 10.5 and QuickTime, rather than in DJ-1800. We are working with Apple to help them fix this bug. If you are using Mac OS 10.4.x, or if you are using any other output mode on 10.5.x, or if you are not using Pitch Lock on 10.5.x, then you will not experience this problem. In fact, in its class DJ-1800 doesn't really have any competition. Some professional Mac DJ applications are much more expensive and they suffer often on "featuritis". Others are more in the "hobby-DJ" class (and also a bit cheaper) and thus lacking some essential features for pro and semi-pro DJs which you can find in DJ-1800. 2.2.1 is the best version ever. The playback is now very reliable (basically due to QuickTime 7 - not all of the earlier problems were the developer's fault!) and the overall performance has been highly optimized. MIDI support is a nice addition, especially if you have one of the supported DJ controllers (I don't). Excellente solution pour des mixs sans grandes prétentions. (Le logiciel peut être un peu imprécis par moment). Facile d'utilisation, fiable et complet.